A cottage garden classic with a contemporary twist. Ideal as a feature plant, make sure you plant it somewhere you'll be able to catch the magnificent scent! Supplied as a clipped standard plant 1m tall. Lavender 'Munstead' will transform your garden with colour and incredible fragrance! This traditional cottage garden favourite is a proven winner in UK gardens; ideal as a fragrant container plant or in a border, make sure you plant them somewhere you'll be able to catch the magnificent scent! They will attract bees and other pollinators perfect for fruit tree growers! Very hardy, incredibly easy to grow, and drought tolerant keep them in great shape by pruning twice a year in spring and late summer. You can even cut the stems to make fragrant indoor dried displays! 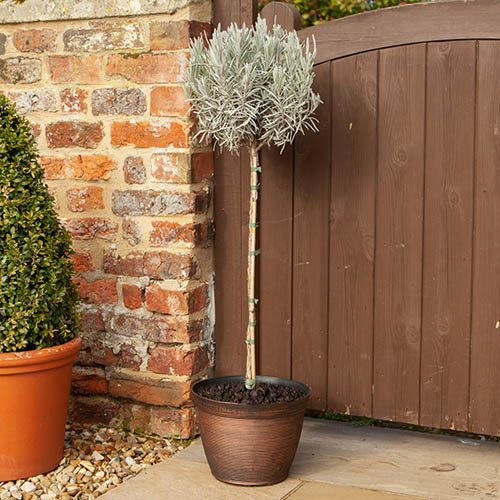 Supplied as a 1m tall standard plant, ready to make an instant impact in your garden. Best planted between April and May when the soil is warming up, lavender thrives in most free-draining soils in full sun. Heavier soils should have some grit added to improve drainage and to open them up.